Situated in Berrara, this vacation home is within a 15-minute walk of Conjola National Park and Cudmirrah Beach. Swan Lake is 0.8 mi (1.3 km) away. 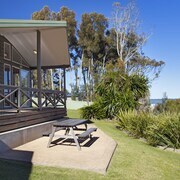 Situated in Berrara, this vacation home is within a 10-minute walk of Conjola National Park and Cudmirrah Beach. Swan Lake is 1 mi (1.6 km) away. Situated in Berrara, this vacation home is within a 15-minute walk of Conjola National Park and Cudmirrah Beach. Swan Lake is 1.1 mi (1.7 km) away. The managers were very considerate of my request for an earlier checkin. Where to find Berrara hotels near an airport? Where can I find hotels in Berrara that are near tourist attractions? Hoping to find accommodation in Jervis Bay, particularly in or around Berrara? There are 6 Expedia-listed hotels within 0.1 kilometres (0.06 miles) of the downtown area. The Bay of Plenty Lodges is the closest Expedia hotel to the middle of Berrara and is only a quick drive away. 25 kilometres (14 miles) from downtown Berrara, is the Paperbark Camp. The Bannisters by the Sea is situated 15 kilometres (9 miles) away. The Sanddancers B&B and also the The Huskisson are two more Expedia-listed accommodation options worth looking into around Berrara. After you have spent some time in Berrara, you should leave time soak up the wider region of the South Coast area. South Coast is marked by beaches and coastal plains, and common South Coast sights include art galleries. Popular things to do in this particular part of Australia include hiking. Looking for more to do? Spend some time discovering Jervis Bay National Park and Lady Denman Heritage Complex, which you'll find in Huskisson, 20 kilometres (13 miles) to the northeast of Berrara. Should you wish to stay in Huskisson, check Expedia's booking pages for the latest deals at the Huskisson Beach Motel and Jervis Bay Caravan Park. Or, you could stay in Vincentia, 18 kilometres (11 miles) to the northeast of Berrara, where you can pick from the The Edgewater Bed & Breakfast and Dungowan Waterfront Apartments. The Collingwood Beach and Vincentia Golf Club are some of the most popular sites to see for those visiting Vincentia. Why not spend an afternoon rubbing shoulders and cheering along with fellow sports obsessives at a local game. WIN Stadium is 90 kilometres (57 miles) to the north of Berrara. For travelers who are keen on staying close by, make a reservation in the Mantra Wollongong or Sage Hotel Wollongong. Illawarra Regional Airport is a logical airport when getting to Berrara. It is 75 kilometres (47 miles) away. Lakeview Hotel Motel is nearby. What are the most popular Berrara hotels? Are there hotels in other cities near Berrara? What other types of accommodations are available in Berrara? Explore Berrara with Expedia.ca’s Travel Guides to find the best flights, cars, holiday packages and more!